Welcome back to our continuing monthly examination of foreclosure data for Massachusetts. Petitions have now increased year over year for 22 straight months and since this is the last month of 2015 data they have officially increased in every month of 2015 over what that month was in 2014. Both Auctions and Foreclosure Deeds were up this month and for 2015 overall. This month we will look at the auction announcements first as they are the least interesting of the statistics. This month saw a decent increase and overall for the year they are up but this is definitely the most volatile number we look at. In 6 of the months we saw small single digit changes, both up and down while the other 6 saw much more sizable increases, especially the first couple with >200% increases. This month there were 563 auctions and 504 back in December 2014 for an 11.71% increase. For the year they were up a lot from 2014 with a 25.20% increase. There were 6,891 auctions scheduled in 2015 compared to the 5,504 in 2014. Next we will look at the Foreclosure Deeds. Unlike the auctions that saw a moderate increase, but one that was less than the overall annual change, the deeds surged up by an amount far above what the overall 2015 level. In December 2015 469 deeds were filed compared to only 321 in December of 2014 giving a 46.11% increase. Overall in 2015 there were 4,399 deeds filed in 2015 which is a 21.42% increase over the 3,623 filed in 2014. Beyond the sizable year over year increase this month and the overall annual increases there are some interesting patterns with the foreclosure deed activity in the quarterly data. Looking at the above graph we see that they have increased quarter over quarter the last 3 and 5 of the last 6. 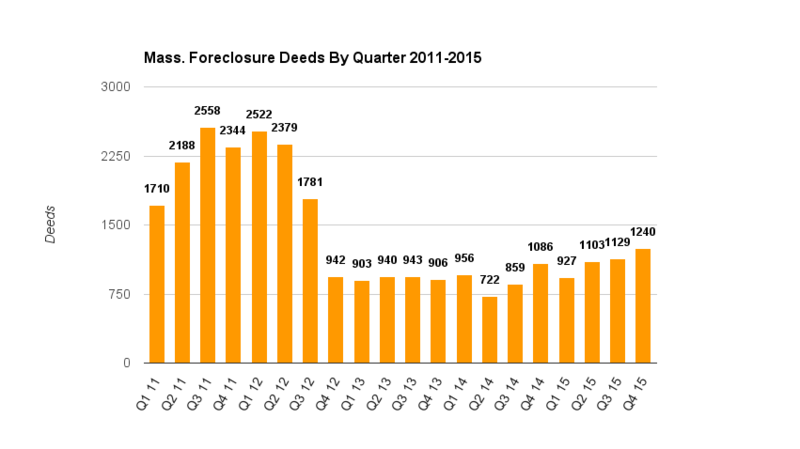 Also that the number of deeds filed in Q4 of 2015 were the most since Q3 of 2012. Granted this level is still far less than it was that quarter but the fact they continue to rise each quarter it could be ramping up to that level again if, as we will see below, more properties keep going into the foreclosure process as well. Finally let’s talk about the petitions, which have now increased from the previous year for 22 consecutive months. As mentioned previously these are generally pretty large increases which have been by at least double digits every time. In December they were up by one of the largest amounts of this whole period. There were 1,224 filed in December 2015 compared to 561 in December of 2014 for a huge 118.2% increase. This is really big increase and even more noteworthy as these have been going up for well over a year now these increases are on numbers that were already up, and increases from 2013 to 2014 were often quite substantial. In this case back last December was up almost 100% from December of 2013. Looking back to December of 2013 there were 285 petitions filed giving an increase for the 2 years of over 329%. Also the 1,224 this month was the most of any month in 2013-2015. For the year with this big surge in the last month petitions are up 55.07% when they were only up right at 50.0% through November. So in 2015 there were 11,767 petitions filed compared to 7,588 in 2014. Since we have the full years of data looking back to 2013 there were 5,210 for a 2 year increase of 125.85%. As with the deed numbers we want to look at the quarterly data over that same range as it paint a very interesting picture. While the deeds are just starting to get momentum in an upward trajectory the petitions are already back to the levels of the late stages of the crisis. As you can see petitions have risen each of the last 8 quarters and 9 of the last 10. This last quarter is the highest quarterly number since Q4 of 2012 and higher than 3 of the 4 quarters in 2011. I think we would all agree that was before things were improving in the market! We will have to see how things progress into 2016 but it seems reasonable to assume that deeds will start to go up in the way we see with the petitions now that the lag time of those increases starting early 2014 are popping out the back end now. Everything was back to going up this month and with all the 2015 data in we see large increases over 2014 across the board and very large jumps over the 2013 levels. The quarterly data discussed gives an interesting new perspective on things as you can see with the longer time frames you see a very consistent patter with the deeds. As mentioned in several previous reports we do not expect to see any big surge in REOs only because the banks do not want to put a lot of downward pressure on the market by flooding it with their inventory. However with the large increase in deeds seen in Q4 they may be looking to get things on the market now to take advantage of the spring market before there is any big decline in the market. 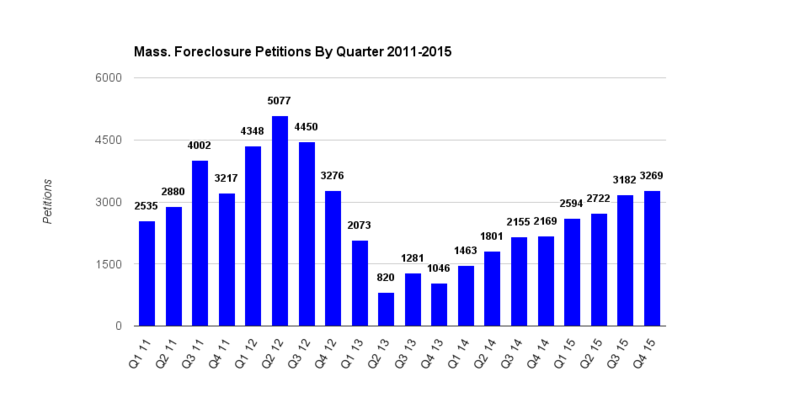 It will be interesting if the REO inventory does start to climb since foreclosures in Massachusetts can easily be 1 to 1.5 years, and often much more, we are still only starting to see some of this 22 months of climbing foreclosure petitions getting though the system. Given that is the case there is little reason to not expect a continued increase in the number of completed foreclosures for at least the next 2 years. So the question is not as much if there will be many more foreclosed homes as much as it will be when will banks release them to the market. REO inventory does seem to be up compared to 6-12 months ago, but still much lower than what we saw in say 2012. As more of these petitions filed work their way through the system (remember a 1-1.5 year foreclosure in Massachusetts is fairly fast) I expect the number to keep increasing. When inventory does come on it will weaken the areas around these houses as it will increase inventory overall and these places do tend to sell below non-distressed properties in the area. Over the last couple of years banks have done more work to places to get a price more along full market value, but unless the places were already in very good shape the bank rehabs are usually unimpressive and do not garner 100% of what a nicely done house gets. So as these places sell they will generally go for less than similar homes in the area and will pull the overall market in the area down, how much is the real question. Since petitions continue to climb each month year over year as well as quarter over quarter banks will be getting more inventory back in the coming months, and years. Since the foreclosure process will generally take well over a year here we should expect foreclosure deeds to stay high for at least the next 2 years, if not much longer. Since sustained increase in foreclosure activity is a leading indicator of a market correction we would recommend being skeptical of predictions of endless growth of real estate markets throughout Massachusetts in the foreseeable future. Those that read our market trend reports you know that there is plenty of evidence that many local markets are already slowing down or even turning the other way.